Joining the ranks of network shows with bargain deals, this week CBS ‘The Talk’ offered their latest installment in this category. MDM especially liked the price on the Akribos XXIV watch reg.$495 for $60. You have until September 29. 2015 to purchase this and other fantastic deals. Designer Maxi Dresses Blow-Out At Dillard’s! Since it is clearly the end-of-summer, season end sales are popping up. 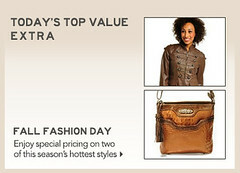 Although there are fewer styles and sizes, the savings are certainly enough to warm any bargain fashionista’s heart. Find maxi dresses to wear now and next year many under $20—I know! Take a look at this maxi dress by designer Adrienne Vittadini, comes in indigo size small, right now only $19.50! If you’ve haven’t shopped Dillard’s lately, these designer deals are a steal and well worth paying the pricey shipping costs (although MDM likes the extra care and attention they give to their packages reminiscent of bygone shopping experiences). While you’re visiting check on the other additional savings in all departments!!! Beginning today, ShopNBC is having their Fall Preview with most items on value pays ranging from 2-6 installments and Fashion Day prices. For instance, MarkdownMom loved the leather military jacket by Genealogy,in black, olive, and brown reg.$229, today $160 with 6 Value Pays. MDM says wear it now as a jacket and this winter as a blazer and add the Matisse “josie” leopard print bootie for the “wow” factor.